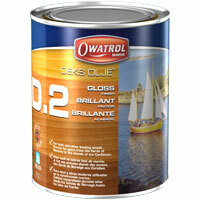 DEKS OLJE D.2 is a flexible gloss finish and should be used over DEKS OLJE D.1 for best results. Use a good varnish brush, roller, or foam (throw-away) brush. Do not thin. Apply one coat per day using any good varnishing technique. Ideal thickness is 6 coats. Sanding between coats is unnecessary, but wet sanding between the last 2 coats gives the highest gloss. Wash finish frequently to remove salt and dirt. Areas that are rough or abraded can be wet sanded (using DEKS OLJE D.1) and followed with 2 coats of DEKS OLJE D.2. When an entire new coat is to be applied, lightly wet sand (using DEKS OLJE D.1) the whole surface and allow to dry. Unused DEKS OLJE D.1 and DEKS OLJE D.2 should be poured into a smaller container and sealed tightly so it is not exposed to air. DO NOT store in freezing temperatures.